Jonathan Blow Thinks Adventure Games Are Bad. So He's Making One. Behind The Witness—Jonathan Blow's next puzzle-esque game after Braid—is a mission. To solve all those awful adventure game tropes. What I'm trying to do as a designer is take everything about adventure games I don't like—cause I loved adventure games when I was a kid but, man, as a game designer now who has ideas about design I just look at them and I think they're all really bad and I just kind of solve them in a way that uses our modern understanding of game design as best as I can. Though generalized in its statement, there's certainly truth to what Blow says. Again, you love it or you hate it. In Blow's case, he hopes to create a hybrid adventure/puzzle game that people will love, free from the typical adventure game snags. So, what is The Witness anyway? We've seen some gameplay of the PS4 game, but perhaps not enough to fully grasp it. The Witness takes place on an island, of which you can learn more depending on how thoroughly you decide to complete the game. Audio recordings you'll stumble on give you an understanding of what the island is and what you're doing there. The island is composed of ten grouped areas, though the game is completely non-linear. Once you gain access to the open area of the island, you can decide to start at the tower or the self-contained buildings or wherever your feet take you. Either way, unlocking at least seven of these will grant you access to the end game, which takes place on the mountain you see in the distance when you first step into the world. Each of these ten areas employs a specific puzzle type that requires you to learn their nature in order to solve them. Think of the puzzles as composed into coherent themes. But all of these puzzles ultimately involve tracing patterns with your cursor on panels set up across the island. There are various pathways to the end point on each maze-like pattern, but the direction in which you decide to trace it will make all the difference. Early on in the demonstration, Blow approaches a set of purple panels. After teaching you the basic concept—which, in this puzzle's case, is to create a divide between the black and white spotted corners of the panel—each panel becomes progressively more complicated. While the first one looks like a simple domino piece with only one black spot and one white spot, the fifth is far more complicated, with the black and white designated squares spotted seemingly randomly across the panel, and even a few blank ones thrown into the mix, too. Once he completes them all it seems like...nothing has happened? No reward? Every panel you solve serves a purpose, Blow says. So while that purple set didn't unlock anything tangible, it did teach you a basic lesson in this game's puzzle-solving needs. Armed with new information and this training, you can set off back to where you first came in, to that one mysterious door you spotted but couldn't solve before. The difference now being that you know what you're doing and what's being asked of you. Blow explains that this is part of the game's long-term progression concept. The more panels you solve and learn from, the more information about the world you're in reveals itself to you. There are no blatant tips or tutorials to help you solve the puzzles in The Witness. The best you get is a flash of light around the final point to where you have to draw the lined pattern. The flash tells you "this is where you want to end up," but the game tells you nothing else. Eventually, once you've taken your baby steps, solving these vague puzzles involves observing your environment. So in the midst of a lush, green landscape and purple hyacinths you'll notice a tree that seems to match the branching pattern of the panel you're staring at. You notice that on said tree is a solitary apple perched mysteriously on a single branch. Now you know which branch you have to trace to unlock this panel. In a building level, Blow unlocks one end of the building by choosing between two end points in a particular panel. The end point unlocks the door that the matches the blueprint of the panel. The panels in this newly-opened area are a set, featuring complex mazes. Spend enough time observing the area around you and you'll notice a wood carving that serves as a window pane on the building you'd just stepped out of. Step behind the carvings and match it up to the panel and...voila. You have your pattern laid out for you. You can trace the lines onto the panel even from afar. The Witness is a game for the perceptive player, it seems, a designation Blow mentions a few times during the demonstration. Puzzles are integrated into objects. Panels represent the architecture of the world. Some puzzles feature the added complication of symmetry, so while you're tracing a line on the left side, an automated line on the right mimics your pattern. That means you can potentially bump into yourself. Again, direction matters. There are penalties, too. In one set of puzzles, Blow has to restart the set if he traces an incorrect line pattern on one of these panels. You can't brute force these, Blow says. 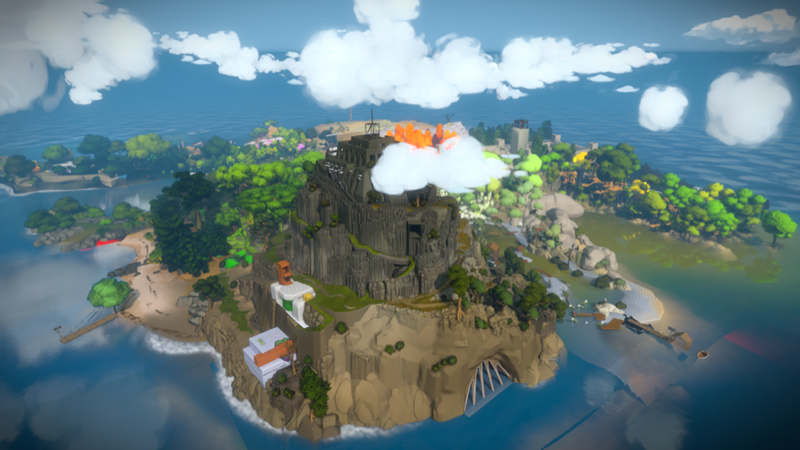 Ultimately Blow wants to ensure that The Witness is challenging. But it's not just about challenge, he says. Even the easy puzzles in The Witness try to be interesting, he hopes. The Witness, then, is Blow's attempt to balance player freedom with clever puzzles. He doesn't want players to feel suffocated if they're stuck on one puzzle. You can solve others to progress instead. You're not screwed just because you got stumped once. So where in typical adventure games you'd have to locate an inventory item—like a key—in order to open a bonus door with hidden secrets, in Blow's game the key is everything you've learned about his puzzles in your time spent with the game. The key is in your head, he explains. I feel I have to end on a note, more about what it's like to attend E3 than The Witness, per se: Jonathan Blow's demonstration of The Witness was my favorite behind-closed-doors demo I've seen at E3. While most other companies opt for tightly produced, E3-specific demos typically composed of five minutes of gameplay and a fancy trailer, Blow threw his game up on the screen, incomplete areas and bugs and all. He moved thoroughly through a decent chunk of the game, taking the time to explain and answer questions without a single "no comment" drop. And while I'm used to, these days, not actually playing many games at E3, repeat demos of what we've seen at press conferences and the like are a little silly. The Witness will debut on the PlayStation 4.